In my recent COMPUTE! columns (August through November 1982), I introduced the "computer friend." The friend is a little animated face that appears on the computer picture screen. A bell rings, and the friend "wakes up" and talks to the child. It asks the child's name. Then it asks the child to play some games. The friend program automatically calls up games (like the story-telling game in the November column). Each time the child is finished playing a game, the friend pops back on the screen. Lots of computer programs are friendly. But few computer operating systems are friendly. The computer friend is my effort to make computers friendlier, warmer, and more human-like for little kids. Children are going to be spending many, many hours in front of these machines. Often the child's interaction with the machine will replace his interaction with other people. If the child's interaction with the machine is cold and impersonal, the child will be losing valuable opportunities to develop social skills. 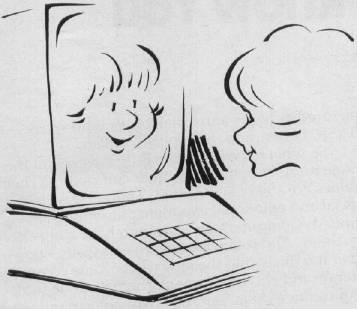 The child's character may eventually begin to mirror the machine's. Already many people are complaining about the effect of computers and video games on older kids. Computer "hackers" are stereotypically pictured as being antisocial loners who speak BASIC better than they speak English. So what happens when little kids spend the same number of hours on their computers? Their values are still being formed. Their reservoir of social and emotional experiences is still relatively limited. 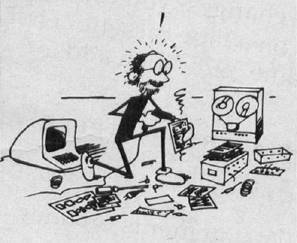 Computers are certain to have a big effect on them. And it may be negative as well as positive. It is likely that the kids will become computer literate and enhance their mathematical, logical, and creative skills. But they may not experience enough of the interaction with adults and peers which is vital to their development. Let's face it. Computers are great as mind expanders and sharpeners. But when it comes to charm and personality, computers are cold fish. That's where the computer friend comes in. The friend is kin to the first computer languages developed in the 1950s. It is a very crude attempt to make computers friendlier and easier to use. Before the early "high-level" languages appeared, people interacted with the computer on its own terms — in machine language. They spent hours, days, weeks translating complicated problems into endless strings of ones and zeros. People got fed up dealing with the computer on its terms. After all, the machine was supposed to be the servant of human beings, not the other way around. People sought ways to get the computer to do its own translation. They developed the early compilers and interpreters that took English-like commands and translated them into the computer's binary language, and vice versa. As a result, the computer became more human-like. It became easier to use and a lot more useful. As a machine that could almost speak English, it became a valuable sidekick for people who needed to solve problems. A computer friend is a lot like the early computer languages. I think computer friends will be the next step in the computer's evolution. Lots of people will find a computer friend much more attractive than the "friendly" computers they're stuck with today. A human-like machine that focuses on a person and his or her problems will be a confidant, a colleague, and a comrade — not just a tool. Here is the latest version of my computer friend program. This friend doesn't play games. It does only one thing: it learns about your child. The older versions of the friend used Atari Graphics 2 Mode to enlarge the friend's face and the computer letters. However, that left less room on the screen for the friend's messages and questions, and the child's answers. In this version, we use the Graphics 0 Mode. This gives us plenty of space — up to 20 characters per line, and up to nine lines of text. In the old program, on line 550, the friend jumped to a subroutine that asked if the child wanted to play games. In this program, the "game" GOSUB on line 550 has been replaced by a GOSUB to a subroutine that asks the child questions. Basic questions about the child's name, address, phone number, age, school, teachers, brothers, sisters, and pets. Important questions like what the child likes to wear, what the child likes to eat, what makes the child happy or sad. Whimsical questions like the child's favorite superhero, the scariest monster, and the names of any imaginary friends. The only limitations are that the child cannot have more than three brothers, three sisters, three pets, and three imaginary playmates. If your child has more, then you need to modify the subroutines on lines 5780 through 5971, and add new DATA statements to those found on lines 13421 through 13456. The computer takes all of the child's answers and stores them in a long string (C$). Percent symbols (%) are used as delimiters between the answers. When the child is finished answering the friend's questions, the friend thanks him or her and tells the child how impressive he or she is. "You are a neat person!" the friend exclaims. If you have old versions of the friend on your computer, look first at the lines preceded by asterisks. These are the lines I added or modified to create the new version of the friend program. This version of the friend is geared to a disk system. At the end of the program (line 5974), the friend saves the child's answers (C$) on a disk file called "CHILD." 5978 OPEN #1, 8, 0, "C:"
Now the friend will prompt the child when it is ready to save the child's file. The friend will tell the child to press the right buttons on the program recorder and press the RETURN button on the computer. Next month I hope to print some of the interesting letters I have been receiving in response to my December 1982 column on "Sexism and Children's software." In an upcoming column we'll teach the friend how to converse with the child using some of the information stored in the CHILD "data base." We'll see how we can automatically create files for several children. I welcome your letters. And I will make every attempt to write back.